In this day and age, the fight for gender equality, feminism and equal pay is on the rise, though with little change. With movements like #metoo we do try to change the long standing, rudimentary and stereotypical mindsets of people, but it’s difficult to achieve success. These are major global issues and something that women face on a daily basis. Since it makes me sad to even think about it, I instead decided to focus on something fun and frivolous. Ever wondered how we do differentiate between sexes in regular day to day life? For example, emotions. Women are globally considered more emotional than men. For some reason, some ‘genius’ somewhere who wasn’t in tune with his emotions decided to blame an entire gender for it and everyone bought it. Even though it seems like there’s truth in it but maybe it’s something else. I don’t think emotions are restrictive to one gender, everyone has them. The difference, according to me, is that women are not more emotional than men but more expressive. So since international women’s day is just around the corner, let’s celebrate this aspect of women. Their ability to express freely and wholeheartedly! Of course, it’s difficult to understand them but then what’s the point of doing something if it comes easy. 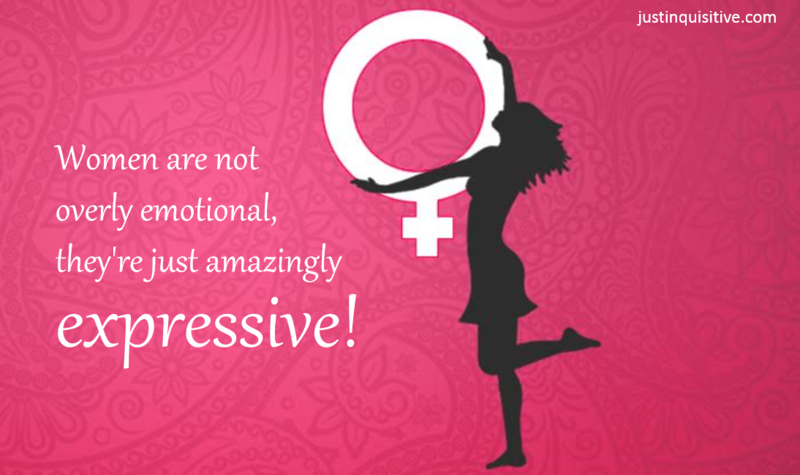 Let’s look at some of the best expressions of women! Every men who has some relationship with a woman will know this face. This expression is usually accentuated by the royal arch of an eyebrow and the slight tilt up of the nose. You know it when you see it. It’s more than an expression. It’s a warning. If the woman in your life ever responds to you in one single, flat, ‘nothing’, do everything in your power to not question her further and just do what she wants you to do. This statement, is usually paired with direct eye contact and a challenge in tone to try and defy her. As if. This is usually shown when women decide that they don’t have the energy/ motivation/ time to entertain your stupid idea. So she would just rest her face on the palm of her hand and look everywhere but you. Do you get it? Well, you might think that the constant chatter about a topic that you know she doesn’t like is fun but it’s not. Pushing someone to their limits in a gym might be a good idea but not with the ladies. Recognize her irritated face and help yourself by not letting her progress to the angry face. Irritated face will be accompanied by slightly flared nostrils and ‘I dare ya’ look in the eye. More than an expression it’s an announcement of a fight where no topic is off limits. The older it is the better. It’s best to retreat and wait for some time to pass before you can go and apologize. Guys look forward to this. The slightly diluted pupils, the dazed look and you might also find her rubbing/ licking her lips. Women have this expression and they do exercise it but if you happen to interpret this wrong, be a gentleman and leave her alone. There are so many of these. The smiling one – nothing you said was funny but she’s just smiling. The goofy look – where she does something stupid and then laughs on herself. The naughty look – eyes go round and she looks side ways as if conspiring with someone imaginary to pull a prank on you. Every woman deserves to be this happy always! So this #WomensDay celebrate all your expressions and enjoy being the wonder(ful) woman that you are! This post is part of a #womensday blogtrain hosted by Jhilmil Bhansali in collaboration with 9 other strong, wonderful, female bloggers to celebrate and cherish the spirit of womanhood. I would like to thank Priyanka for introducing me in her blog post. Now it’s time for me to introduce the next blogger in this blog train, Varsha, a passionate blogger, an aspiring author, freelance content writer and mother to two adorable kids, she considers herself capable of donning various hats with ease, as and when need be! Do read her #WomensDay blog coming up tomorrow! Happy Women’s Day to all!!! I totally enjoying it… Lovely expression I am trying also..
Haha. I was smiling through the post. We sure can speak volumes with our expressions.